(May 4, 2017) – CJ 4DPLEX (www.cj4dx.com), the world’s leading 4D cinema company, today announced that Marvel Studios’ Guardians of the Galaxy Vol. 2 is available in the 4DX format. Having premiered first in Norway and France on April 26th, the film continues its worldwide distribution at 369 4DX auditoriums in 47 countries including but not limited to the U.S., U.K., Canada, Mexico, South Korea, China and Japan. “Guardians of the Galaxy Vol. 2” is based on an American comic and is produced by Marvel Studios. The film is distributed by Walt Disney Studios Motion Pictures, written and directed by James Gunn and stars Chris Pratt, Zoe Saldana, Dave Bautista, featuring Vin Diesel as Groot and Bradley Cooper as Rocket. The highly anticipated sequel follows 2014’s Marvel Studios’ “Guardians of the Galaxy,” which boasted a tremendous opening weekend performance in the 4DX format, with an overall occupancy rate of 85 percent in the U.S. The sequel will be available in 369 4DX auditoriums, compared to 2014’s 100 auditoriums. The “Guardians of the Galaxy” franchise joins a list of Marvel films that have been released in 4DX, including three of the top 10 highest grossing films of all-time – “Marvel’s The Avengers,” “Avengers: Age of Ultron” and “Iron Man 3.” Marvel’s Super Hero films have repeatedly attracted record breaking audiences in 4DX, proving that action and superheroes work well with the format. The two latest Marvel Studios’ releases, “Doctor Strange” and “Captain America: Civil War”, remain among the all-time top five 4DX performers. “Superhero films maximize the abilities of 4DX’s immersive motion technology and we’re excited for fans to have the opportunity to view the film in a format that transcends the traditional theatre viewing experience. We’re also very confident that Guardians of the Galaxy Vol.2 will follow in the footsteps of previously successful Marvel Super Hero films in 4DX,” added Byung Hwan Choi, CEO of CJ 4DPLEX. 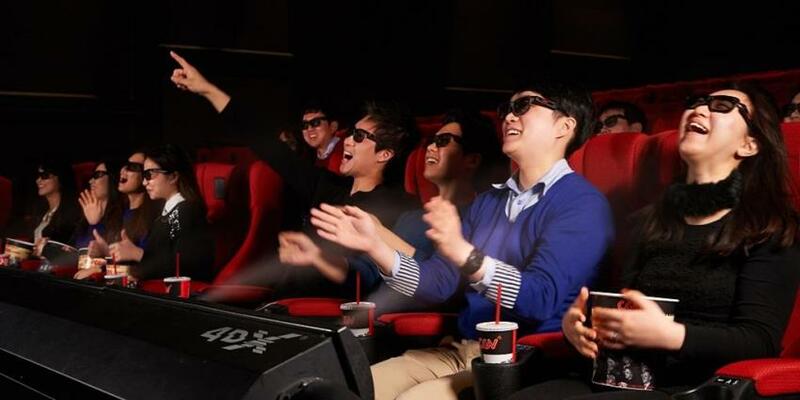 4DX is rapidly expanding and continues to open two auditoriums a week, around the world. CJ 4DPLEX is the world’s first 4D cinema company, headquartered in Seoul with international offices in Los Angeles and Beijing. The company created 4DX, the first and leading 4D cinema technology for feature films, providing moviegoers with an immersive cinematic experience that utilizes all five senses, allowing the audience to connect with movies through motion, vibration, water, wind, snow, lightning, scents, and other special effects that enhance the visuals on-screen. CJ 4DPLEX brings 4DX auditoriums to exhibition partners along with 4DX codes for both major Hollywood blockbusters and local titles. Each auditorium incorporates motion-based seating synchronized with more than 20 different effects and optimized by a team of skilled editors, maximizing the feeling of immersion within the movie, beyond the limits of audio and video. Since 2009, more than 420 Hollywood titles have been screened in 4DX. As of April 2017, more than 45,000 4DX seats operate in 370 auditoriums spanning 47 countries. CJ 4DPLEX was named a Most Innovative Company of 2017 in Live Events by Fast Company. For more information, please visit www.cj4dplex.com.